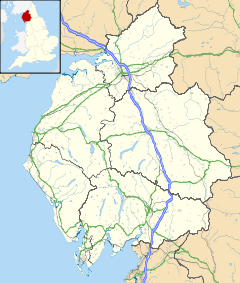 Dalston is a large village and civil parish within the Carlisle district of Cumbria, England. It is situated on the B5299 road about four miles (6 km) south-south-west of Carlisle city centre, and approximately five miles (8 km) from Junction 42 of the M6 motorway. The village is on the River Caldew and is served by the Dalston railway station on the Cumbrian Coast Line between Carlisle, Workington and Barrow in Furness, taking over two hours for the full journey. There are two popular schools in Dalston, St. Michaels Primary School and Caldew Secondary School which has over a thousand pupils. There is also a Nestlé factory producing powdered milk, a BP fuel depot and a factory producing specialist materials called Cowens. Dalston was the birthplace of sculptor Musgrave Watson (born in 1804) and the translator Georgiana Harcourt who was born three years later. Dalston Hall is a grade II* listed fortified house which is now a country house hotel. An electoral ward in the same name exists. This ward stretches north towards Carlisle itself with at total population taken at the 2011 Census of 6,051. ^ "Dalston Hall Ny 376515, Dalston". British Listed Buildings. Retrieved 10 September 2013. ^ "Ward population 2011". Retrieved 24 June 2011.